Here’s another of the 70s albums on my list. 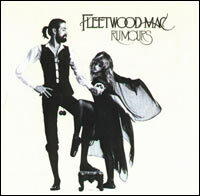 Fleetwood Mac’s Rumours was released in early 1977 to critical acclaim and blockbuster sales. To date it has sold more than 19 million copies and stands as the 10th best selling album in U.S. history. The album was famously recorded under the most tumultuous circumstances imaginable. The band members were falling in and out of love and in and out of bed with each other at an alarming rate, sometimes not speaking until they entered the studio to record the next song. On top of that, everybody was loaded on drugs and booze. Rumours‘ tracklist reads like a greatest hits: ‘Second Hand News,’ ‘Dreams,’ ‘Go Your Own Way,’ ‘You Make Loving Fun,’ ‘I Don’t Want to Know’ — it’s hard to believe they’re all on the same record. Fleetwood Mac is the best kind of band… one where every member has a distinct personality and role. Quick, name me a second member of Counting Crows. Bet ya can’t. But Fleetwood Mac could star in a sitcom about a band — Everybody Loves Stevie! ‘The Chain’ is the only song on Rumours that’s credited to all five band members and for that reason, as well as its placement on the record and its overall mood, it feels like the centerpiece. It’s not quite my favorite track on the album but it’s the one that holds everything else together. This entry was posted in song of the day and tagged Fleetwood Mac, Rumours, The Chain. An interesting pick, and a good one. As for your challenge, I can’t name anyone else from the Crows (though I know there is a guy who sings on occasion and makes the band sound more like REM.) However, some of the most famous bands do feature those distinct personalities–whether it is the Beatles, The Who, The Rolling Stones or the Eagles. I think you may be on to something with your theory that a band made up of strong disparate individuals ultimately achieves a level of greatness that other bands whose members stand in lockstep behind a front man don’t. My association with this song is how much our mother adored it, when it was used, I believe, as one of the songs in her Jazzercise class. Listening to it now, that seems unlikely, but maybe I’m remembering it sort of right…. ?